Introducing our new young man Donny. He's a one off and purrs like a machine. He is an official Pets as Therapy Cat he loves meeting people. So if you would like him to visit a care establishment then please contact us. Black smoke our very first home bred kitten. A big softie and a clumsy clot. Dam is Mainetrax Hells Belle and Sire is Sarafina Prince Valiant. He is a Black Smoke and is neutered. 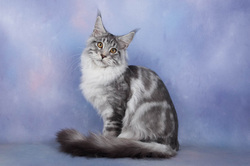 Our beautiful boy with thanks to super Belgian breeder Nancy Reyns and her Born to Love Cattery. Thunder lives with our associate breeders Nicky and Barbara Taylor at Lilynocket. Laid back and a big baby he is a dream to show as he is so relaxed and happy. We hope his temperament will pass on to his future offspring. Our beautiful Blutiluca Mikki, gorgeous but slightly unruly! He's a stay at home neuter with attitude. Fernando is The son of Maintetrax Tarot O Fortuna and Coonattack Icebaer Artic Storm Song. He's a lovely happy cat who likes to 'talk' a lot! Neutered show boy.